Not really funny. Color blind people can see color…they just have a hard time distinguishing between a small number of colors. I’m pretty sure gray isn’t a color they have trouble with. One in 33,000 people are born with Achromatopsia in which they can only see various degrees of grey. It’s rare but it happens. 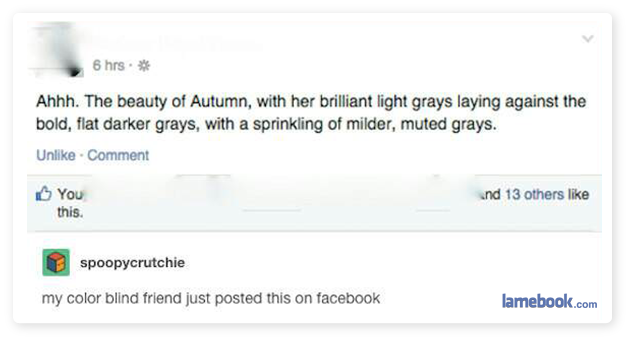 Too bad the color color-blind people see instead of the color they can’t see isn’t grey, huh. Googling “how color blindness works” before making fake posts is too much effort, I guess.